Staff Help Desk is established in the CSC to provide one-stop consultation and technical support service on workstations, campus network, etc. If users cannot resolve their problems through telephone consultation, technical support team or technicians will then be dispatched to help on site. The Staff Help Desk also monitors the progress of users' requests/problems and provides analysis and feedback to the CSC management for further improvement on its service quality and users' satisfaction. 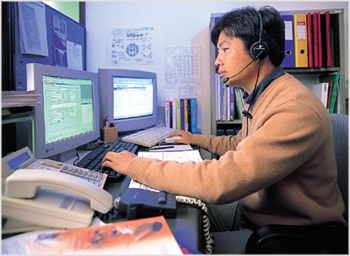 To facilitate the day-to-day operation of the Staff Help Desk, a sophisticated Web-enabled system has been developed. The system offers features like incident logging, problem tracking, on-line submission and enquiry of work requests, auto acknowledgement, feedback collection, generation of management reports, and so on.